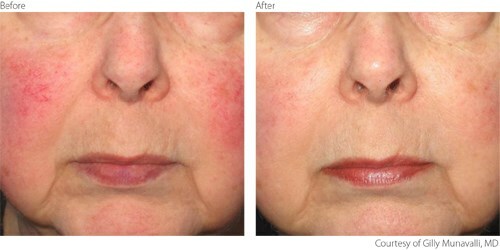 Rosacea is a chronic skin condition which expresses itself in redness on the face and sometimes on the neck and chest. The exact cause of Rosacea is yet unknown and many who are affected by it are unaware of their condition. 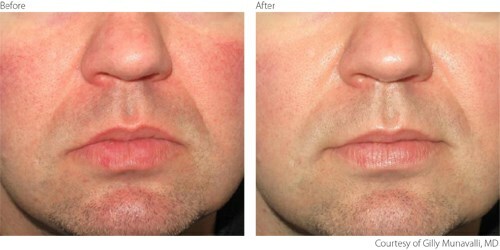 Rosacea can be effectively treated using Intense Pulsed Light (IPL). IPL uses controlled light in specific wavelengths to alleviate the inflammation, redness, pimples and uneven skin tones caused by the condition. IPL offers a gentle, long-lasting solution for those suffering from Rosacea by providing a gradual and natural improvement to the skin’s appearance. The Lumenis IPL with OPT™ is considered the industry’s ‘Gold Standard’ for treatment of vascular lesions and its efficacy has been proven in over 80 peer reviewed papers (IPL bibliography of studies and peer reviewed articles). The IPL procedure removes facial superficial vessels and as a result dramatically decreases or completely eliminates facial redness. The vascular components of Rosacea can vary from flushing to telangiectasia and can have different densities and depths. With a choice of multiple vascular cut-off filters and unique pulse sequencing, Lumenis’ IPL with OPT™ can coagulate each sub-type of capillaries, reducing the redness and simultaneously triggering neocollagenesis which limits the reccurrence of the condition. Optimal treatment safety and efficacy using Optimal Pulse Technology (OPT™) and Multiple Sequential Pulsing (MSP™) which facilitate achieving the desired clinical results with enhanced patient comfort. types.